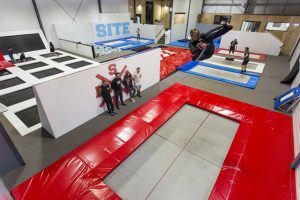 Newly reopened (Sept 2016) in a different Frankton location with lots more jumping options than before, there are now over 20 trampolines allowing both children and adults to practise all kinds of skills. There are 7 olympic sized trampolines, several wall tramps, and for those with tricks to master, 2 Supertramps claiming to be the most powerful trampolines in the world! There’s also a foam pit and an air bag. Prices are for a 1 hour session (see opening times for session start times). Jumping numbers are restricted so it’s best to book online and there’s no lower age limit. The new location is within the Remarkables Park Town Centre so plenty of shops and cafes around, although there is also a shop onsite selling snacks and coffee and a lounge with viewing gallery if some of the party aren’t bouncing. Address: 1 Red Oaks Drive, Remarkables Park Town Centre, Frankton, Queenstown. This is near the airport, about 15 minute drive from downtown Queenstown. Open: daily 9.30am – 9.30pm. Jumping sessions are every hour on the half hour, starting at 9.30am, with the last session starting at 8.30pm. Call or book online for one of these sessions. Price: Under 6 years old $15, over 6 years old $25. Try checking here on Bookme for discounted entrance.